What are Messy Ltd Runs? Does a Ltd Run ever become a Messy Color? Can I use the photos on your site? I like to use my rods down to the nubs. How can I remove the Messy stickers? Why are Messy rods so uniform if they are hand pulled? How are CiM item numbers organized? Do you make stringers of Messy Colors? Do you sell Messy Color frit? How can I tell if a Messy Color is a transparent, opaque, opal, or moonstone? Which Messy Colors work best with silver & reactive glasses? How can I tell if a Ltd Run is about to sell out? Where can I find a printable palette of Messy Colors? What is the difference between Peace, Marshmallow, and Cirrus? Where can I find a color gallery that includes CiM? 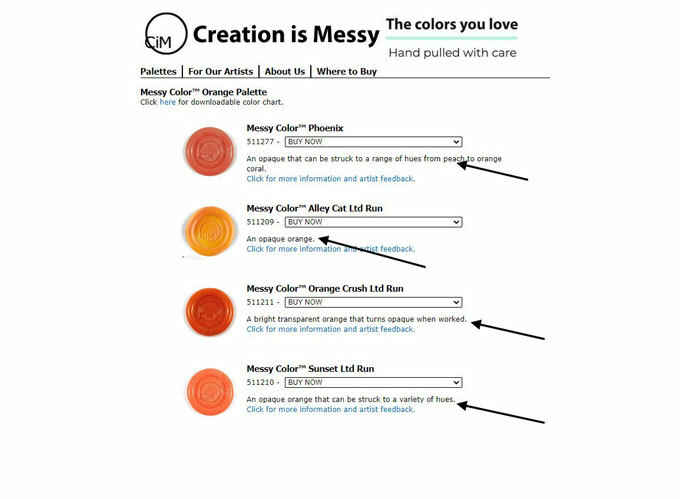 What are your top ten bestselling Messy Colors? What are the Messy alternatives to ivory? Many people have asked about the origins of the colors we label as "Limited Run." What does it mean? Where do they come from? Why is it limited? "Limited Run" essentially means a color that is not currently included in the standard lineup of colors that Creation is Messy produces repeatedly. There are several ways that a color may be produced as a Limited Run. We regularly produce colors in response to artists' color requests, we conduct continuous R&D, and we have a high standard of quality control on the colors that we produce. Each of these processes leads to Limited Runs in its own way. Let's be clear: Creation is Messy is driven to bring great colors to glass artists. It's what we do. We love when artists share their ideas for new colors. If you have an idea of something you'd like to see, we'd love to hear from you! Please share your color ideas with us. When we melt colors in response to color requests, those colors will be marked as a "Limited Run" before sale. This lets us deliver the color to meet the request while at the same time gauging market response to the product. It also allows us to bring the color out more quickly since we don't have to reproduce it consistently 3 to 5 times, which is our standard requirement before adding any new color to our stable of colors. Similarly, when we are going through our experiments during R&D, we may come up with colors that are not exactly what we were going for, but that are still nice and compatible. Since we reproduce new colors consistently 3 to 5 times before adding them to our regular line up, we can end up with some great, if unexpected variations. Many of those variations will be released to the wild as "Limited Runs." 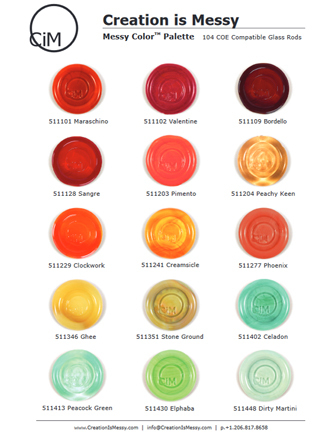 Finally, color consistency is paramount to our product line. We want you to know what you're getting, and to get what you expect when you purchase our product. To make sure of this, we've implemented very narrow tolerances for variations in color that must be met for a batch of glass to be sold as that named color. Instead of having a 'color' that actually covers a wide range of variances we choose instead to mark any glass that falls outside our tolerances as different and deliver them as a "Limited Run." We believe this is the right thing to do to make sure our artists have the right information about their purchases. All our Limited Runs must meet the same quality and compatibility standards as the rest of our product line. Limited Runs are a great way to expand your color palette and fill in gaps with colors not generally available. We hope you enjoy these unique opportunities. If there is any color you would like to see, please let us know! If you are reselling CiM, please contact us for a link to download our paddle photography (the CiM medallions). Some of the paddle photos are watermarked- these are the work of our tester and photographer Miriam Steger. The watermarked photos are protected by copyright and therefore are not to be altered in any way. Miriam has graciously agreed to allow CiM resellers to use these photos for internet sales only. The photos must remain unaltered and with the watermark intact. Please do not use the watermarked photos to make advertisements. The beads and artwork photos on our site have been generously contributed by many artists as well as our testers. The artist photos are the property of the artists who contributed them for our site. If you wish to use any of these photos, you must first contact the artists directly for permission to do so. The artists' contact information can generally be found by following the link to their name. If you soak the stickers in water for a few hours (or long enough to become saturated with water), they will detach themselves from the rods. A glass cleaning solution will help remove the residue. CiM experiences the same difficulties and irregularities in glass production as other manufacturers. We are dedicated to producing the highest quality glass rods, so we reject production runs that do not test compatible or can otherwise be characterized as just "bad" glass. When a production run does pass our compatibility tests, we hand inspect each rod to check that they are straight and smooth, consistent 4-7 mm diameters, free from irregularities, stones, bumps, dust, scratches, bubbles, etc. Basically, we only sell the very best rods of the cane pull to our customers. The last two digits indicate a number for the color. A Limited Run is a color that may be difficult to find in perpetuity. For more information about Ltd Runs, please read above. We sell stringers for Hades, Tuxedo, Peace, and Clear. We know that stringers have traditionally sold in 2-3 mm diameters. However, our testing team expressed an overwhelming preference for the 1-2 mm size, so we offer both. We have packaged as carefully as possible to prevent breakage. Each quarter pound bundle is wrapped in tissue paper and tagged. We do not tag the stringers themselves as we found this cause for breakage. Stringers are more difficult to pull than 4-7 mm rod and the prices are higher accordingly. We introduced stringers in a variety of other Messy Colors to test the marketplace but found there was little interest other than Hades, Tuxedo, Peace, and Clear. If you would like to know if stringers are available in any given color, simply look at the paddle image for size availability. 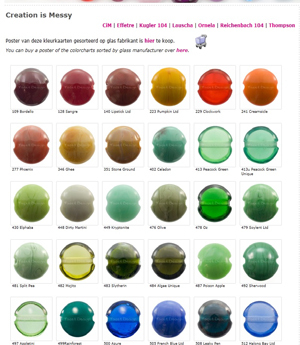 If a size is listed, then the color is available in 4-7 mm and the listed size. 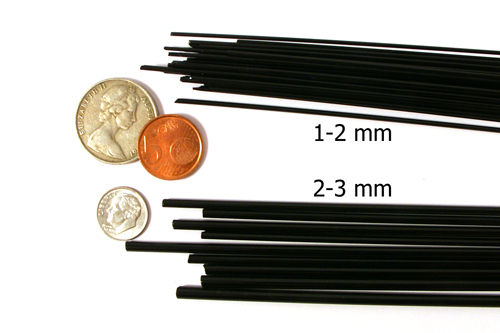 For example, Messy Hades, as shown here, is available in 1-2 mm and 2-3 mm as indicated as well as 4-7 mm. If there are no sizes on the paddle, then it is available in 4-7 mm only. We no longer sell frit. You can find some CiM colors in 104 CoE Fritty Bits by Melanie Graham. We encourage you to browse Melanie's fabulous blends for inspiration. Messy moonstones are Cirrus, Halong Bay, and Peacock Green. The formulae and working properties for these three are different and distinct enough that we cannot lump them into the other categories. 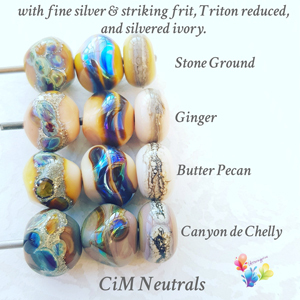 We asked our testers which Messy Colors work best with silver & reactive glasses. Hades won hands down. 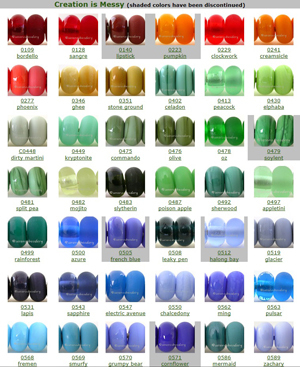 Here are other notable colors: Canyon de Chelly, Great Bluedini, Sangre, Crocus, Heffalump, and Sepia. Do you have a favorite Messy Color + silver glass combination? We would love to post it on our site. 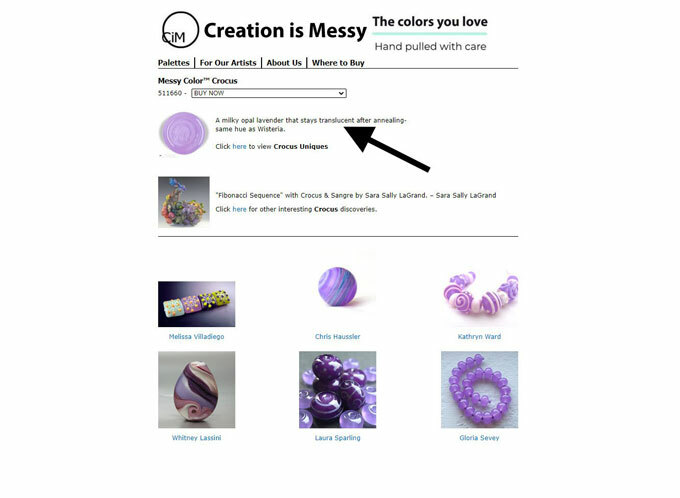 Please submit a description of your beads and photo sized 800 x 800 to info@creationismessy.com. We publish a Watch List of Ltd Runs that we will soon run out of in our e-newsletters. You can register for the CiM e-newsletter here. 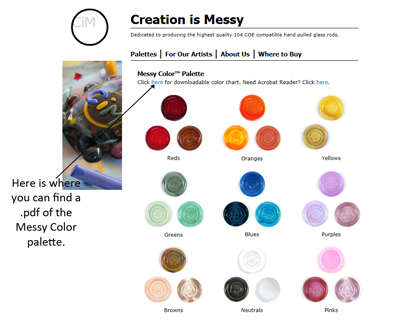 Here is where you can find a downloadable or printable .pdf of the Messy Color palette that we are committed to keeping available and in stock. Thanks to Genea Crivello-Knable for this photo. Special thanks to Trudi Doherty for the comparison photo!